Taurus (April 21st-May 21st) is the second sign of the zodiac and its symbol is the bull. One word can be used to describe a Taurus: dependable. Taurus is a fixed sign, meaning that Tauruses do not like change. New ways and ideas crease unease and anxiety in a Taurus. 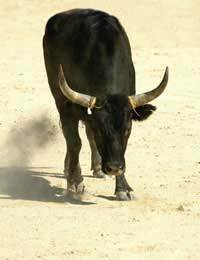 Do not try to rush a Taurus into something new - they will refuse with the stubbornness of… well, a bull! Perhaps because Tauruses themselves dislike change and disruption in their lives, they are very patient with others. They have a steadiness about them that seems to draw others in. Reliable and dependable, a Taurus rarely has to worry about being friendless or jobless. Because of their sense of duty, they make great employees and trusted friends. As part of their dependability, you can count on a Taurus to get a job done - no procrastinating here. Their stubbornness and tenaciousness can assure that a job will be done to its completion. Tauruses have a soft and gentle side to them as well. Although firm and steady is their personality, they are also very loving, giving people as Venus, the goddess of love and beauty, rules them. Tauruses look for stability in all aspects of their lives - love, jobs, and home life. They are often happiest in the security of their home, as this refuge is very important to them. They are collectors, taking great pride in their collections, and have a great eye for antiques and elegant objects. Material items comfort them and make them feel more protected. Venus also brings out the host or hostess in a Taurus as they love to entertain. They relish in eating good food and quality wine in stylish surroundings. They find inspiration in art, music, and design. Part of the good life to a Taurus is being able to pamper themselves. Like bulls, a Taurus' obstinate nature can be troublesome at times. Some people view Tauruses as lazy because it may be hard to get them moving, but in truth, they reserve their energy for projects they want to do, not what others want them to do. Although you may never see their temper, rest assured that all Tauruses have one. Underneath the patient surface lies in wait a personality that does not like to be challenged. If you do not mess with the bull, you will be fine. But, if you do - watch out! Tauruses can become very attached in relationships, so they tend to be possessive if they feel it necessary. People who do not understand that material goods mean security to a Taurus may see their possessions as self indulgent and greedy. Neck and throat - On the positive side, many Tauruses have beautiful voices, but on the negative side, they are in danger of colds, laryngitis, sore throats, and thyroid problems. A Taurus' dependability makes them great workers. You know they will stick with a job until it is finished. A Taurus can be a very stable factor in your life. If you choose one for a friend, you know you can rely on them. They love to entertain lavishly, but also enjoy their quiet home life.